BOH754. 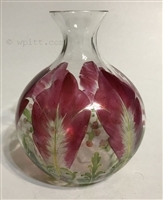 Bohemian or Austrian Art Nouveau enamel decorated vase of amethyst flowers and leaves on clear crystal glass vase. Ground top. Excellent condition. 5 3/4" tall. BOH766. 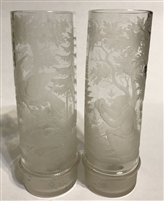 I don't know who the maker is of this pair of beautifully carved vases, but I would attribute them to Austrian/Bohemian. The entire vases are wheel carved and the first depicts a gentleman lighting a cigar under the protection of his hat, and his dog in a heavily wooded area. The second shows a bird sitting in the branch of a tree observing a nearby deer, also in a heavily wooded forest. Very detailed and exquisitely done. 7" tall. BOH741. 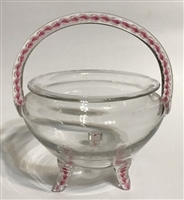 Attributed to Bohemia is this clear crystal basket with applied pink and white twist filigree feet and handle. An unusual paperweight-related item that is seldom seen. Ground pontil. Excellent condition. 8” tall, 6 ¾” diameter. Unusual art glass vase with all-over millefiori canes and spatter. The interior has an iridescent gold finish and it is signed on underneath side with a propeller mark. The propeller mark at one time was thought to be Webb. It is now believed to be Harrach. You be the judge! 10 ¼" tall. BOH389. Wonderful engraved and gilded Bohemian art glass vase. Clear crystal shading to a green with a floral engraving on three panels. The panels are surrounded by gold gilding. 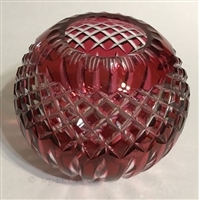 It has an applied crystal foot and scalloped top. Truly a magnificent piece. 13" tall. Condition: minor wear to gold gilding, otherwise excellent condition.